Home » Blog » A historical building filled with cocoa! Comments Off on A historical building filled with cocoa! 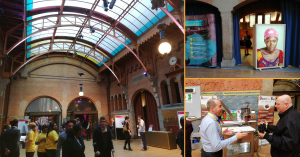 Some days ago Agiboo was at the Beurs van Berlage Amsterdam Conference Center. There, the Chocoa festival took place offering the opportunity to its audience to meet cocoa producers, specialists and associates from all around the globe. The smell of chocolate gently hit your face when entering the trade fair from the entrance. It made you feel warmer and eager to explore all trade stands. To touch cocoa beans and try out some fine chocolate bites. Cocoa farmers and chocolate producers from Ecuador, Peru or Mexico exhibited their finest cocoa products. We also met cocoa associated companies who look after the quality and selection of cocoa beans and work as well as a one stop cocoa storage. Family businesses and young entrepreneurs showed their passion for cocoa to the visitors at the trade fair. Beurs van Berlage hosted the conference right in the center of Amsterdam, some steps away from the Dam square. The twentieth-century Dutch architecture of the historical building combined with the cocoa exhibitors traveled you back in time when the Dutch setting up the base for the commodity trading. The Beurs van Berlage was the third stock exchange building in Amsterdam in a row. In 1884 Amsterdam announced an international competition for the design of a new stock exchange building. Among the contributors was HP Berlage (1856-1934) who, together with his then associate Th. Sanders delivered a design. Berlage was appointed as a member of the Stock Exchange Commission on the initiative of Treub, from which it almost automatically followed that he would also design the new stock exchange. On Berlage’s advice, the building would be erected on Damrak, which was filled up to the Oudebrug. This allowed a costly and lengthy expropriation procedure to be avoided. The construction started in May 1898. Five years later, on May 27, 1903, Queen Wilhelmina officially opened the new Koopmans fair. The Goods Fair moved there together with the Grain and Stock Exchange, the Schippersbeurs (ship traders) and the Chamber of Commerce that took over the hall above the main entrance at the Beursplein. Since 2008, the Beurs van Berlage offers its historical atmosphere and location for inspiring events, cultural and social activities and conferences. The building also hosts various trade shows and expositions or festivals, like the Chocoa festival 2018. With the phrase “Good cocoa, better chocolate”, the Chocoa Festival opened its doors on 24th of February and offered various conferences, speaking notes, workshops and a true multinational trade show. 150 stands all around the globe waited to greet visitors and cocoa connoisseurs at the Beurs van Berlage. The event gave the opportunity to industry’s stakeholders to connect and understand in depth each part of the supply chain. And when you understand the importance of each player in the “cocoa game”, then you realize how you can deliver your contribution more efficiently. We met farmers who traveled all the way from Peru just to show us their cocoa products. Family businesses with sustainable plans for making chocolate. Happy cocoa quality testers and cocoa exporters or traders. Even young entrepreneurs offering online platforms to assist the cocoa farmers. So many people, so many roles, so many different businesses. How can a cocoa farmer be connected with a cocoa consulting specialist? How a small family business could exhibit next to a bigger cocoa company? Well, because each one understands the role of each other. And everyone has the same passion for cocoa. That is why is growing its CTRM users in the cocoa industry, we understand the industry challenges and have a passion for cocoa!